The last couple weeks have seen a mixed bag of weather conditions across the Northwest. Several days of sun and rain have helped to melt the trail out, but a few days of colder temps and even new snow across the Crest have hampered progress. Several hikers attempting to trek across Oregon have been reporting a variety of difficult conditions, with many jumping off the trail to await improvements. In the few areas where the trail is clearing, the mosquitoes are starting to appear. Be prepared for a variety of difficult conditions—deep snow, excessive blowdown, high creeks—and use extreme caution. (See Trail Conditions for more info.) If you’re not familiar with winter travel and backcountry navigation, consider alternate hiking destinations until more favorable conditions return. If you’re planning on venturing out, be familiar with winter hiking skills, and check out our reviews on traction devices and rain shells. Weekly trail conditions updates will resume in July. The weather across Oregon for the next couple days continues to look cool and wet, with rain in the forecast. Things look to clear and start warming this weekend, with continued sun and comfortable temps into mid-next week. Daytime highs across most of Oregon’s southern and central Crest look to be in the low- to mid-70s, with chilly overnights mostly in the upper 40s. The northern portion will see daytime temps in the 60s on and around Mt. Hood, and jumping up into the 80s in the Columbia River Gorge. Click on the links below for local forecasts. The PCT, still under lots of snow, near Siskiyou Peak. Photo by Marci Hanson. 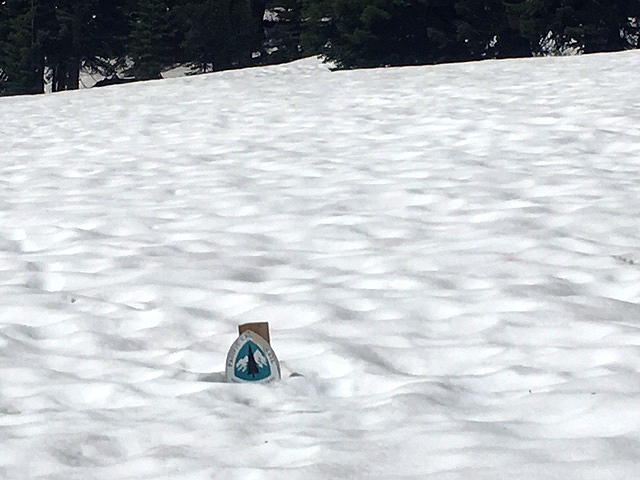 • Southern Oregon – The Siskiyou Mountains received another few inches of snow in the last week, and hikers have reported challenges between the border at Donomore Pass and Grouse Gap. From the I-5 crossing all the way to Fish Lake is mostly snow-free. The snowline resumes heading into the Sky Lakes Wilderness and Crater Lake Nat’l Park, which both remain buried under snow. There are also reports of excessive blowdown (downed trees) in the Sky Lakes and Mt. Thielsen wilderness areas. • Central Oregon – The Diamond Peak and Three Sisters wilderness areas are still under several feet of snow—including several inches of new—and are remain largely inaccessible. The trail around Santiam Pass, in the exposed B&B Burn area, continues to melt out. The snowline resumes near Three-Fingered Jack and continues thru the Mt. Jefferson Wilderness to Olallie Lake. 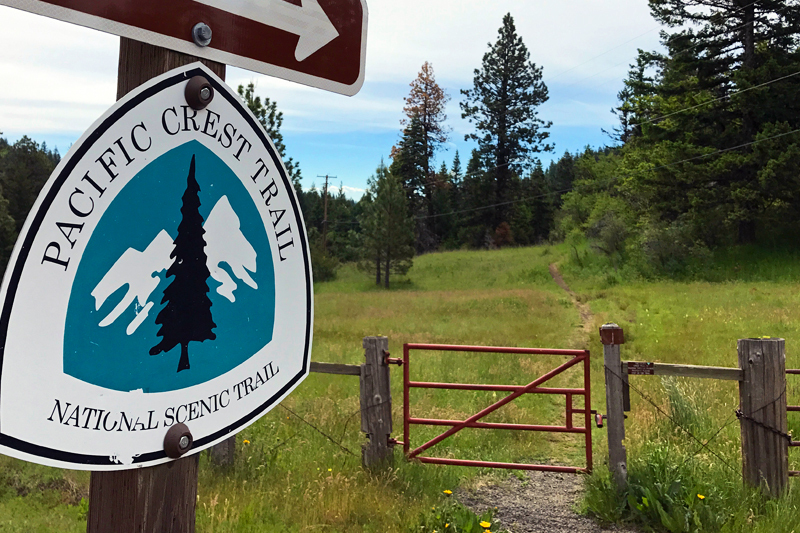 • Northern Oregon – Spotty snow remains thru some of the Warm Springs Reservation area, with the trail clearing around Timothy Lake. The snowline returns near Wapinitia Pass, increasing in depth thru Barlow Pass and on up to Timberline Lodge. The trail around Mt. Hood is still completely buried, and conditions persist thru the Benson Plateau. Crossings on the Zigzag and Sandy rivers are extremely high and hazardous. There are several miles of clear trail out of Cascade Locks. Springtime is when avalanches occur more frequently with sudden warming conditions. If you’re planning on exploring the backcountry this spring where slopes and trails are still under several feet of snow, check for avalanche warnings in the area. A very snowy Mt. 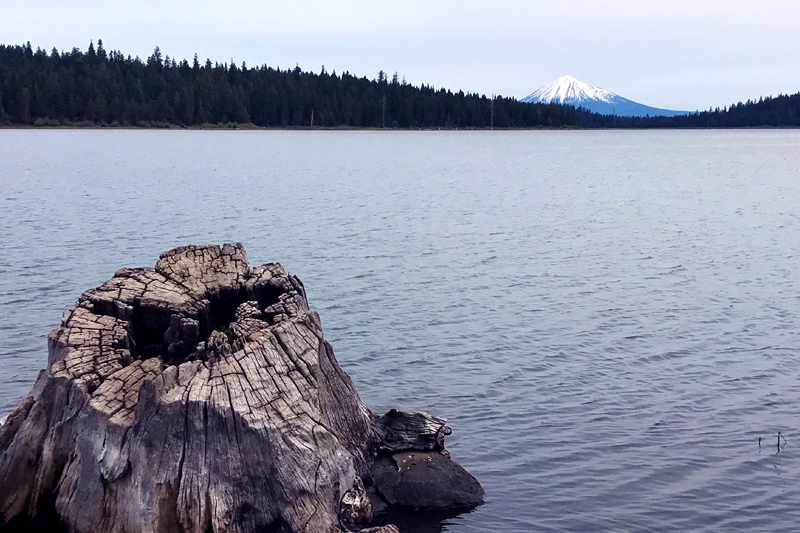 McLoughlin as seen from Hyatt Lake. Photo by Eli Boschetto. The main highways crossing the Cascades are all clear and snow-free, but most of the smaller forest roads will remain inaccessible until summer. • Crater Lake National Park – The southern entrance road is open to Rim Village and partway around the west side of the rim to Discovery Point. The remainder of Rim Drive and the north entrance road remain closed due to snow. The Rim Village cafe and Park Lodge are open. The restaurant and shop at Mazama Village are now open; campground availability is open but limited. • Cascade Lakes Scenic Byway (OR-46) – The road is now open, but most trailheads and PCT access points are still buried under snow. Parking will be limited in these areas. • McKenzie Pass Hwy (OR-242) – ODOT has been working on clearing this road, which is now scheduled for opening on June 19. It is currently open to bicycles only. Check Oregon’s road conditions at ODOT. Thanks to PCT hikers Marci, Eric and Nigel for their trail reports. PCT: Oregon is looking for Oregon PCT hikers to help contribute trail conditions information to this site for the summer 2017 hiking season. If you’re interested in helping out your fellow PCT hikers by sharing news, photos and info on trail conditions in your area, please contact site admin here. Thank you! Header photo: The PCT crossing at Green Springs Summit on Hwy 66. Photo by Eli Boschetto. The information on this page is collected from a variety of sources, including NOAA, ODOT, SNOTEL, PCTA, PCT Water and the U.S. Forest Service. For more information on PCT Conditions in Oregon CLICK HERE. This page will be updated on a weekly basis during the summer hiking season. “There are also reports of excessive blowdown (downed trees) in the Sky Lakes and Mt. Thielsen wilderness areas.” – It is pretty clear that nobody is doing much to maintain the trail through Sky Lakes. Last year going through Sky Lakes there were about 400 trees across the trail, and some of them clearly had been there a while. There were about 100 down in the first 5 miles. It was awful. Yeah, this area has really taken a beating over the last couple winters. The PCTA is aware and is planning two logout projects in the Sky Lakes for later this summer. More info HERE.